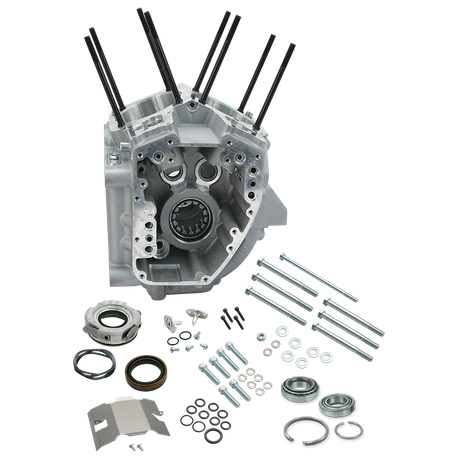 This crankcase is intended to replace the crankcases in HD® Twin Cam 88® engines in existing HD® chassis only. S&S stock style crankcases have a rear motor mount that bolts directly to the stock 1999-'06 transmission for all models except 2006 HD® Dyna®. These crankcases are compatible with the stock primary, charging system, and other stock components. S&S replacement crankcases are not available for HD® Twin Cam 88B™ or 2007-'16 HD® Twin Cam 96™ or HD® Twin Cam 96B™ engines. Stock bore cases are perfect for replacement applications, 4" bore cases are a natural for use with the S&S Super Sidewinder® Hot Set Up Kits®, and 41/8" bore cases make really large displacement custom engines possible, and are available with the S&S cylinder stud pattern or with the stock cylinder stud pattern. 41/8" bore cases with stock stud pattern are ideal for the S&S 124" Hot Set Up Kit® for stock crankcases. Oil line installation kit part #31-0424 is required for installation in 1999-’05 Dyna® models. This kit includes a special transmission top cover and oil lines. Oil line installation kit part #31-0425 is required for installation in 2000-'06 FLT models. Stock transmission top cover may be used. Not legal for sale or use on CA or EPA pollution controlled motorcycles.